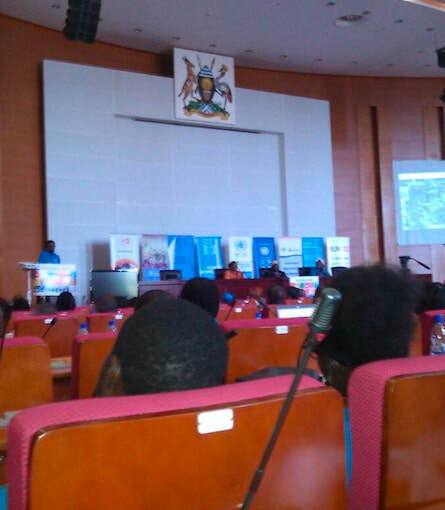 Far from the United Nations in New York — where the UN Sustainable Development Goals (SDGs) were adopted by all UN Member States in 2015 — UN Day 2017 was also celebrated, at the grassroots, on October 24th, in Uganda’s capital city Kampala. During this day — the UN’s 72nd ‘birthday — activities were carried out in four primary school divisions of Kampala Capital City Authority — Kawempe, Nakawa, Rubaga and Makindye. This event was an example of global goals translated into grassroots action. 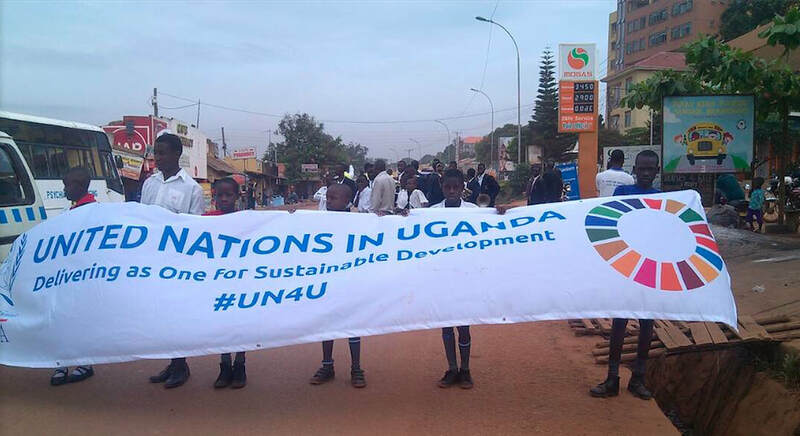 A street-wide banner introduced the topic and school lessons highlighted the UN SDGs. Major activities were focused on climate action — for SDG # 13 — and urbanization — for SDG # 11. Tree and grass planting was accomplished, plus cleaning of the city markets and roads and painting of school blocks and improvement of the sanitation in the congested city slums. Each were given trees to plant. The Makindye Division hosted top UN Delegates — including the Resident Coordinator of UNDP, Ms. Malago, and all the Heads of the UN agencies of UNICEF, UNESCO, FAO and ILO. They also planted plenty of grass and several trees in the school compound, as well as painting school blocks and cleaning neighbouring communities. Over 20 education institutions were invited and each were given trees to plant. The Mayor and Town Clerk of the Makindye Division also attended — as children sang songs and were given gifts. The first Deputy Prime Minister General Moses Ali officiated at the function on behalf of Government. At the end of the day, all the groups were invited to the Prime Minister's office [below right] for official remarks and a cup of tea. 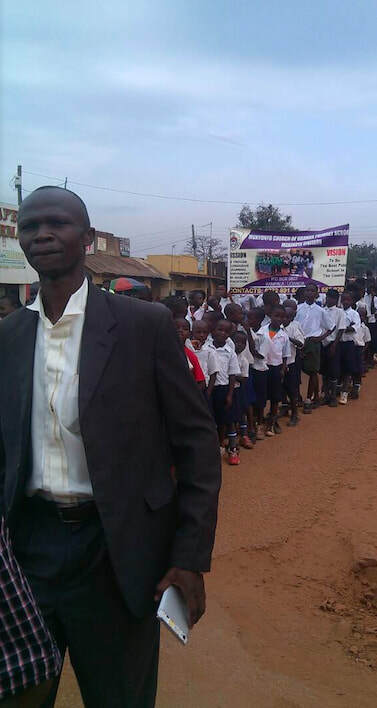 Ugandan Primary School children lined-up — with their teachers [below left] — prepared and excited to learn about these Global Goals — during their observance of UN Day, 2017. This 'Day' was organized by Andrew Mukhwana and Mr. Kasango Alphonse — two leading Kampala Primary School Teachers — were among the key organizers of this opportunity for their students to learn more about development needs and deeds in Uganda, East Africa and across the world. 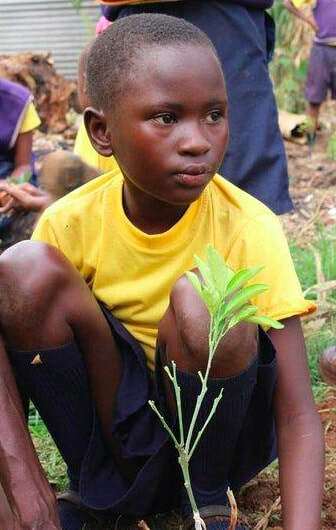 Photo Credits: The boy in a yellow shirt — planting a tree (above right) — is from GoOverseas.com. All other photos courtesy of Andrew Mukhwana, Headteacher of the Munyonyo Primary School, in the Kampala Capital City Authority. Graphic Credits: Above left, the UN SDGs Colour Wheel and each of the 17 UN SDG logos are posted here using the official UN SDG Logo Guidelines.